Nashville Predators defenceman P.K. Subban has been placed on injured reserve with an upper body injury and will be reevaluated in two to three weeks according to the team. Nashville Predators defenceman P.K. Subban has been placed on injured reserve with an upper body injury and will be re-evaluated in two to three weeks according to the team. This move means he will miss Tuesday night's game with Montreal, the team that traded him to the Predators last summer. <a href="https://twitter.com/hashtag/Preds?src=hash">#Preds</a> say P.K. Subban has placed on injured reserve and will be re-evaluated in 2-3 weeks. <a href="https://twitter.com/FriedgeHNIC">@FriedgeHNIC</a> reported herniated disk for D-man. Subban has not played since December 15, missing the last seven games for the Predators. Nashville is 3-2-2 in his absence and currently sits fifth in the Central Division. 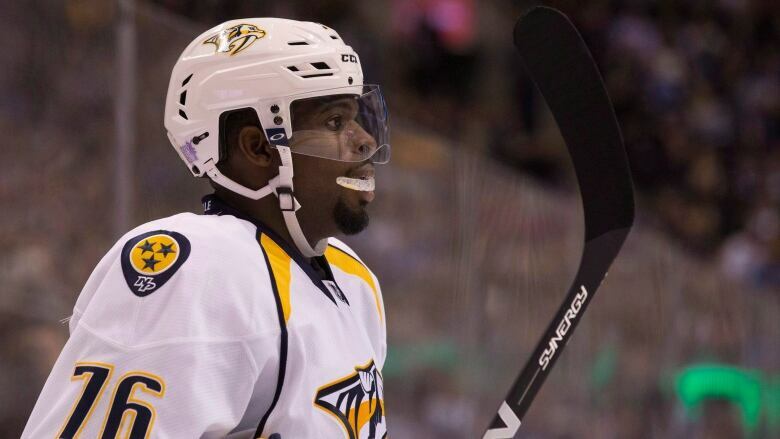 Subban has seven goals and 10 assists in 29 games with Nashville this season.